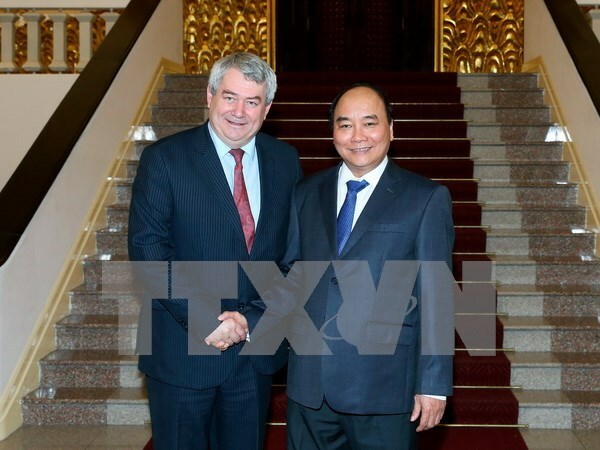 Hanoi (VNA) – Prime Minister Nguyen Xuan Phuc suggested enhancing cooperation between Vietnam and the Czech Republic in order to further expand the bilateral relations in a more practical and effective manner. The PM highlighted the great potential for the two countries to boost affiliation in the coming time during his reception in Hanoi on October 29 for Chairman of the Communist Party of the Czech Republic and Moravia Vojtech Filip. He wished that the Communist Party of the Czech Republic and Moravia, the Czech Parliament and Government will continue creating favourable conditions for the Vietnamese community living in the Czech Republic to uphold their role as a bridge promoting cooperation and friendship between the two nations. Briefing the guest on Vietnam’s socio-economic development in recent year, the PM said Vietnam is active in building a socialist-oriented market economy under the leadership of the Communist Party of Vietnam (CPV). He also agreed with Vojtech Filip’s proposals to foster relations between two countries in the future. For his part, Chairman Vojtech Filip, who is also Vice Chairman of Czech Parliament's Chamber of Deputies ( lower house ), appreciated Vietnam’s recent achievements, saying that he believes the CPV and Vietnamese people will made more successes in national construction and development. He hoped his country and Vietnam will promote trade and economic cooperation mechanisms in the time ahead. A number of major Czech companies made fact-finding tours to Vietnam on the occasion of his visit to the country to seek cooperation opportunities with Vietnamese partners, he noted. While praising the role played by Vietnam in the Southeast Asia region, Vojtech Filip proposed tightening future cooperation across fields between the two nations, especially in the economy, trade and defence and in areas of his country’s strength.